This double window devoted to Robert Browning's poem "Saul" beautifully balances the composition of the Rabbi Ben Ezra Window. The other window's medallions of Youth and Age, a knight battling a monster, and God the "Potter," are echoed in the Saul Window's depictions of David before Saul, Saul battling the Philistines, and Christ the Redeemer. Browning's poem builds to David's prophetic vision of God's plan for the redemption of mankind through Christ. 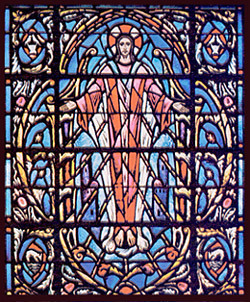 In the upper window, the radiant figure of Christ as the Redeemer stands before the Gates of Heaven, "See the Christ stand." In the lower window, David kneels and plays the tune "for which quails on the cornland will each leave his mate." Looking down on David is the dark figure of Saul, "erect as that tent-prop, both arms stretched out wide" with flashes of light across his body from "a sunbeam, that burst thro' the tent roof." Nearby are the quail, the sheep, and the jerboa mentioned in the poem. The center medallion shows Saul in "manhood's prime vigor," as he goes forth to battle. Rays of light from the Hand of God fall toward Saul signifying heavenly approval of his early deeds. Above is the symbol of a city, "a people is thine." Excerpts from Robert Browning's "Saul"
stretched out wide . . . .